A world-first study has found a hormone commonly used to induce labour in pregnant women, oxytocin, has significant benefits for some children with autism. One in 68 Australian children is diagnosed with the disorder, which affects their communication skills and makes it difficult for them to interact socially. "Often people with autism are incredibly bright and have lots of potential in so many ways," Associate Professor Adam Guastella, from the University of Sydney, said. "But they often miss the important cues that guide social behaviour." In the study published in the journal Molecular Psychiatry, Researchers at the University's Brain and Mind Institute looked at 31 children aged three to eight and monitored them over 15 weeks. During a five-week period, the children were given a nasal spray containing oxytocin. Sydney mother Christine Blue said the impact on her son Hayden was dramatic. "By week three and four my husband and I were saying 'yes this is the active ingredient and we are noticing a difference'. By week five we were just really, really pleased with the results," she said. "He was more willing to be in a group. He was more willing to be involved in a conversation ... He was just a happier child. His eye contact was better. It wasn't perfect but it was better. And he was just talking a whole lot more." Ms Blue said the oxytocin spray seemed to unlock her child's personality, and allow him to reap the rewards from years of therapy. "We were doing a whole lot of intervention before oxytocin," she said. "We weren't really seeing a lot of results. The oxytocin trial seemed to be the point where Hayden was able to put all the puzzle pieces together. "And from that point on Hayden's development has gone from strength to strength. "For example ... he'd be in the car and come out with 'I like being in the car', and because we're not used to hearing anything from him, my husband and I looked at each other and were like 'did he say that? Did that come from Hayden?'" Now the vibrant seven-year-old is happy to discuss his love for dinosaurs, monster movies and his sister, Lauren. Associate Professor Guastella said the results were promising, with about a third of participants in the study showing significant improvement. "It's the first time that medication has ever been shown to improve social interaction skill. These results tell us that we've got something that seems to be working for a portion of people and is doing something which hasn't been done before," he said. "Oxytocin is not a cure for autism and there isn't likely to be a single treatment for autism in the near future," Associate Professor Guastella said. He said when there was more evidence that the nasal spray worked he had no doubt drug companies would be able to distribute it. "Oxytocin nasal spray is available. Drug companies need to see more evidence and more research to be able to justify their distribution of it across Australia." 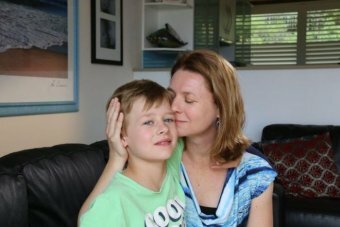 He said researchers at the Brain and Mind Institute and the Telethon Kids Institute in Perth were recruiting 120 children with autism aged under 12 for a larger study. "The big question really is how does oxytocin affect the brain to influence social behaviour? And that's what we're leading the world in currently," he said. Ms Blue said she was delighted with the results, but was pragmatic about the potential prescription of the spray in the future. "Oxytocin won't make your child normal," she said. "But speech pathology and OT [occupational therapy] won't make your child normal. There's no cure for autism. There's just good management. "I want more families to think about having their children in clinical trials. "Autism is just increasing in our society. We're not going away. There's going to be more of us coming to a school near you." For the Blue family the spray had no major side effects, but some participants experienced issues with thirst, urination and constipation. Note: the following article shows little or no understanding of "behaviour therapy" for autism: the cost it suggests is seriously inflated and the text show little or no understanding of Early Intensive Behavioural Intervention for autism spectrum disorder. A synthetic version of the “trust” hormone oxytocin, delivered as a nasal spray, has been shown to improve social responsiveness among some children with autism, researchers from the University of Sydney have found. Published today in the journal Molecular Psychiatry, the trial is the first to rigorously examine the effects of oxytocin over a long time period in young children with autism spectrum conditions (ASC). ASC affect many aspects of a child’s development, including social and communication development. But while it’s an important step forward, the effects observed in the study are simply too small and too inconsistent – and the stakes are simply too high – for anyone to herald a new autism wonder drug. Behavioural therapies are considered the first line of therapies for ASC, and on many fronts these have proven to be effective. The drawbacks, which are not discussed as often as they should, are the considerable costs. Consider for a moment that one recommended regimen of behavioural therapy is upwards of 20 hours per week. Highly trained therapists cost approximately A$150 for every one hour session, and so the financial burden adds up very quickly. Only a small number of families have the capacity to allocate the necessary resources to these kind of programs. This leaves the majority of families seeking therapy alternatives. The search for effective pharmaceutical therapies is not just due to the financial and time costs associated with behavioural interventions, but also because these behavioural therapies are not highly effective for all children with ASC. Autism has had a faddish relationship with pharmaceuticals. Numerous drugs over the past half a century have shown promise for benefiting individuals with ASC, and almost instantaneously achieve world-wide fame. But without fail, after further rigorous research, each of these drugs have been found to be no more effective than a placebo. Other drugs have been found to be ineffective in reducing core ASC behaviours, such as social and repetitive behaviours, but may provide benefits for associated difficulties, such as sleep or anxiety. Fads come and go. Hope gets raised and inevitably dashed. It was into this landscape that oxytocin began being tested as a potential pharmaceutical for ASC. Oxytocin is a hormone that affects social cognition and behaviour, and has been the “molecule of the moment” for close to a decade. The human brain produces oxytocin naturally, and is involved in promoting childbirth and lactation reflexes. Research in ASC has focused on the possible effects of providing the brain with a dose of synthetic oxytocin. In studies of adults, the administration of oxytocin as a nasal spray has been found to improve trust as well as several aspects of social ability, including eye gaze and emotion recognition. These latter abilities are characteristic difficulties of individuals with ASC, and so oxytocin was very quickly examined as a potential pharmaceutical therapy for ASC. Until this point, studies examining the effects of oxytocin on individuals with ASC have produced contradictory findings. Several research groups have identified small improvements in social behaviours in adults with ASC, while others have identified little to no benefits (in studies of adults children, and adolescents). The study included 31 children with an ASC aged between three and eight years of age. The study used what is called a “cross-over” design, which involves two phases of drug administration. In the first phase, each child is allocated into receiving either oxytocin or the placebo. After five weeks of taking the drug, the groups then switch, so that the group that received the oxytocin in the first phase now receives the placebo, and vice versa for the group that initially received the placebo. This is a neat design because it means that participants act as their own “control”. This enables scientists to directly compare each child’s abilities after taking oxytocin with their abilities after taking the placebo. The children received the oxytocin or a placebo through a nasal spray bottle. The placebo looked and smelled exactly like the oxytocin spray, but contained none of this active ingredient. Children received one spray of the relevant bottle in each nostril, morning and night. Importantly, the study was “double blind”, which meant that neither the family nor the investigators knew what was in the spray bottle during each phase until the conclusion of the trial. After the trial finished, the researchers were “unblinded” to the content of the spray bottles. The key finding was that the children with ASC showed significant improvements in “social responsiveness” after a period receiving oxytocin, but no improvements after a period receiving the placebo. Social responsiveness refers to abilities such as social awareness, reciprocal social interaction and social anxiety avoidance. In this study, social responsiveness was assessed by the parent using a widely used questionnaire. However, oxytocin was found to be no more effective than the placebo in its effect on measures of repetitive behaviours and emotional difficulties. This was a rigorously conducted trial, and the results indicate that oxytocin may provide small benefits to some children with ASC. There are limitations to this study that must be acknowledged. While the number of children included in this trial is among the largest of any previous study – particularly given the “cross-over” design, which increases the statistical power – the sample size is too small to make any sweeping conclusions about the importance of oxytocin in ASC intervention. But the study does provide a strong platform upon which further science can be conducted. Larger studies of oxytocin as a potential therapeutic for ASC are currently underway in both the United States and Australia, and will provide a greater evidence base in this area, as will studies examining the effect of oxytocin in conjunction with more traditional behavioural therapies. However, despite these preliminary positive findings, it is important to remain keen observers of the complicated history between ASC and the limited progress into new pharmaceuticals. And in that context, the decade of research on oxytocin that has preceded this study is highly instructive. Oxytocin may provide benefit to some children with ASC, but it is not a panacea and it cannot yet be recommended for children until further studies are conducted.